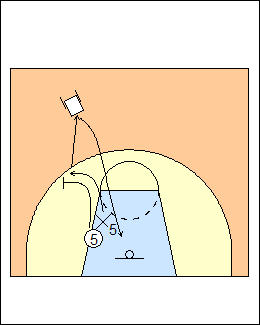 Defending ballscreens, they will hard hedge, flat hedge, squeeze and go under (bump the screener up), or push it down (blue). Work on hard hedges with a partner, 5 runs up from the low post to set a ballscreen, X5 yells "pick right", slides out in a straight line to touch a chair, turns and runs back. X5 should have hands low (outside his knees) to make the ball go towards halfcourt, not foul with his body, and prevent a split. Move the chair to change the angles, e.g. for a flat hedge.